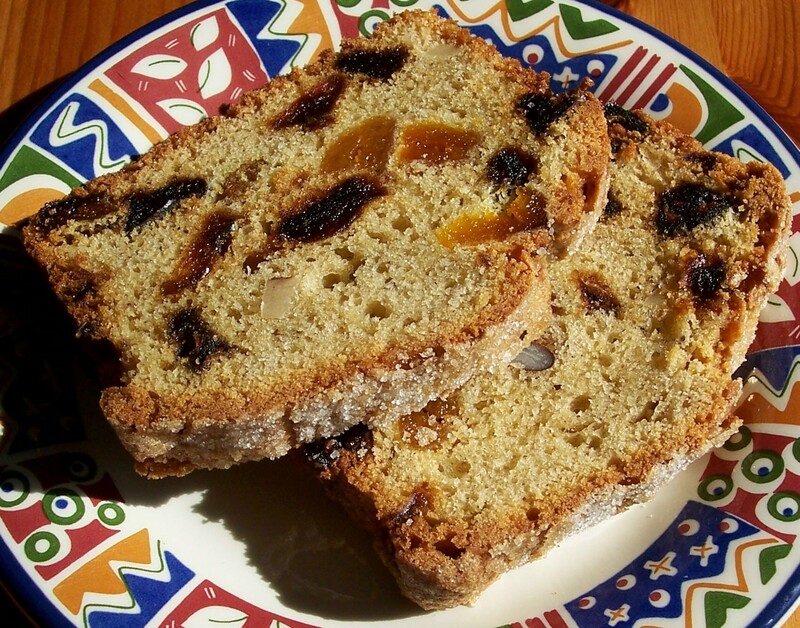 This recipe is based on the ‘Knock Up’ Fruit Cake basic recipe, with apricots, dates and brazil nuts taking the place of the dried mixed fruit. This version would be good for a special occasion as it uses more expensive ingredients: I made it when my mother came to tea with us on Mothering Sunday.For this cake the quantity of mixture was doubled, using five eggs and it was then divided between two equally sized tins. I mixed the cake mixture the evening before it was baked the following lunchtime, covering and leaving it in the fridge overnight. I had not tried doing this before but it did not affect the finished cake in any way. I would definitely make this fruit cake in advance again if necessary. The sugar topping was added just before the cake was baked. In this case I was over generous with the sugar I had reserved, but the cake ended up with a lovely thick and crunchy sugared topping. Mix and bake the cake using the basic recipe instructions, replacing the mixed dried fruit at Step 5 with the apricots, dates and brazil nut pieces and sprinkle over reserved sugar for a crunchy topping. Goodness, you’ve been doing a lot of baking since I was last here. Loving all these fruit loaves. I especially like the sound of this combination – yum. Thank you Choclette. I’m currently posting a selection of cakes I have made in the past few weeks and this is one of our favourite combinations.